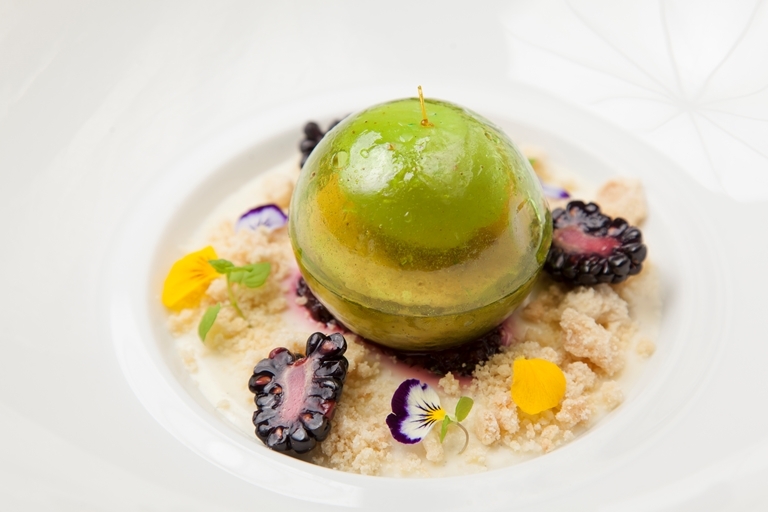 This stunning molecular apple dessert by Aaron Patterson is a gourmet nod to the traditional flavours and textures of a classic British apple and blackberry crumble. Apple and blackberry compotes, laced with Calvados and crème de mure respectively, are paired with apple sorbet and a golden crumb, while custard is swapped for a creamy vanilla panna cotta. When making the striking sugar dome centrepiece remember to check the fan is off before putting the powdered caramel in the oven.